Business Insider Australia writes July 18 that "as the U.S. economy improves, people are going back to work, investing in their homes, and preparing to make new purchases. They’re also going to spend a lot more time in prison." That assessment is based on an investor guide from Corrections Corporation of America, the largest private imprisoner in the US, which notes that the economic recovery will result in more prisoners. "Economic Recovery Will Drive Populations Higher" CCA writes. "Recessions interrupt (prison) population growth. 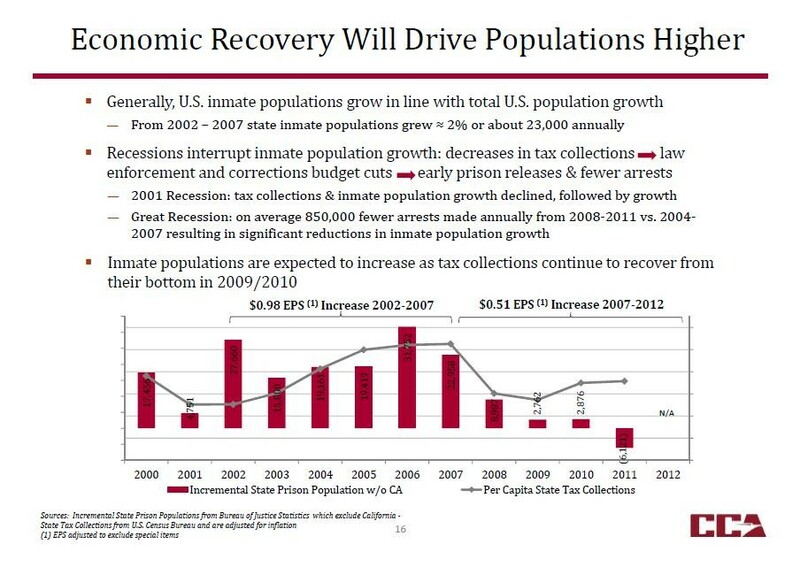 ... Inmate populations are expected to increase as tax collections continue to recover from their bottom in 2009/2010." That's right. A private company just noted the opportunity to profit from imprisoning more human beings than ever before. About 10 percent of the $74 billion US corrections market is privatized, up from 7 percent in 2002, CCA states. Established in 1983, CCA holds 44 percent of the private prison market, overseeing 67,975 beds. CCA is strongest in the South, but about 12 percent of CCA revenues comes from California. CCA made $181 million in profit in the first quarter of 2013. For-profit prison companies lobby the US government at all levels for more incarceration, often in the form of drug laws, the American Civil Liberties Union finds. Consequently, between 1970 and 2005, the number of people incarcerated in the US grew by 700 percent. The US has 5 percent of the world’s population, but 25 percent of the world’s prisoners. Twenty-four states are operating public prisons at 100 percent or more of capacity, the federal prison system is at 136 percent capacity, and CCA is looking to take more prisoners off the hands of states. For-profit prison growth went from 7,000 inmates in 1990 to 129,000 inmates in 2009 — that's a 1600 percent increase. CCA also says that it has “occupancy guarantees” from certain jurisdictions, meaning the federal government has promised CCA will have enough people to imprison, one way or another.